"FIN-AL-E"!!! The world's first comprehensive machine quilting DVD is here. 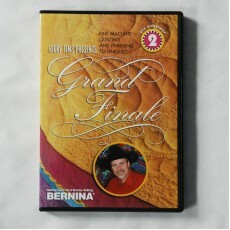 Ricky's Grand Finale DVD workshop is available to all who are interested in "Fine machine quilting and finishing techniques"! This is the 2nd in a series of instructional DVD workshops. Grand Finale is chock-full of so much information that quilters the world over will put this resource at the top of their list. This DVD covers everything you need to know once the quilt top is complete: * innovative marking techniques * creating your own quilting designs * managing the quilt *machine trapunto * bobbin quilting * bobbin trapunto * two exciting heirloom bindings made completely by machine. In addition, the DVD contains bonus items of a video gallery of Ricky's quilts, bloopers, and Quilting Caveman Style and Fishin', original music composed by Ricky exclusively for this workshop.